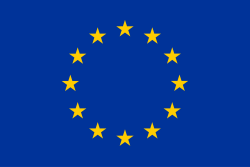 The project will analyze heat pumps and building integrated solar solution specifics and their individual challenges towards performance increasing, cost reduction (optimized size, installation cost reduction etc. ), increased reliability (lifetime and reduced maintenance) as well as their integration in 5 Technology packages that will be demonstrated in the 8 SunHorizon demosites. 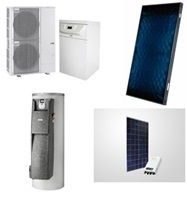 The integration between solar and heat pumps technology aims to cover the whole H&C demand of the building, to maximize solar self-consumption and guarantee adequate internal comfort. 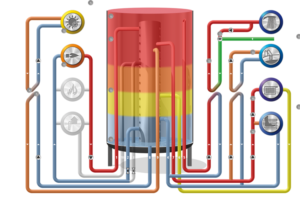 BoostHEAT is developing its technology in order to replace coal and oil as H&C systems fuels as well as increase energy savings By 2020, fuelled with natural gas, the boostHEAT’s boiler will replace massively coal and oil boilers as well as high efficiency gas boilers in the European the building market (largest sector with 40% of total final energy consumption). boostHEAT is indeed a natural gas driven HP consisting of a single thermodynamic module with one or more thermal compressors in parallel, a heating head, a low-NOx burner, an exchanger, CO2 heat pump circuit, and a control system. boostHEAT has designed a wide range of systems with output power from 20 to 250kW so as to cover the heating, hot water, and cooling demand (145kWh/(m2 y)) in the building market, in particular for single family house, collective residential and commercial buildings (retail shops, offices, hospitals, schools, pools, sport centres). For commercial and collective applications, with a power of 50 kW to 250 kW, a CO2 thermodynamic module with six or more thermal compressor. 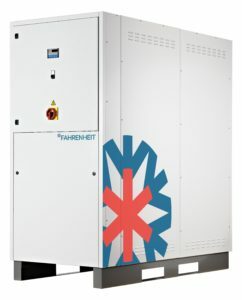 In order to further increase the share of sorption technologies for heating and cooling in buildings, Fahrenheit has recently proposed and developed a hybrid sorption/compression chiller, for residential as well as industrial applications1. This solution, coupling, in cascade, a sorption module with a compression chiller, allows overcoming limitations of the sorption chiller technology, related to the needs of a backup system to produce a cooling effect even in case of lack of thermal energy to drive the sorption system. In this regards, the hybrid sorption/compression chiller allows increasing the share of renewables at building level, representing a strong reduction of the dependency on fossil fuels as well as related CO2 emissions, thus strongly de-carbonising the heating/cooling sector. Hybrid solar allows a real synergy between photovoltaic and thermal: a hybrid installation produces two to four times more energy with the same surface; it meets the requirements of thermal regulation by reducing the need for heat while regaining profitability through the production of self-consumed electricity. 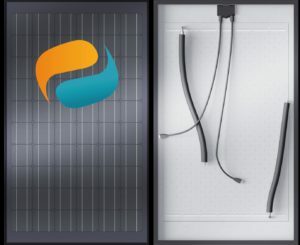 The DualSun solar panel is an advanced hybrid solar (PV-T) technology that produces simultaneously electricity (photovoltaic) and hot water (solar thermal). The patented system intelligently integrates a photovoltaic panel with a heat exchanger on the back sheet, to produce up to 3 times more energy than a traditional photovoltaic panel. Testing performed, in late 2015, on the DualSun panel along with 3 major PV/T panels, by the Institut National de l’Energie Solaire (INES) are summarized in Errore: sorgente del riferimento non trovata2. The results confirmed superior performance of the DualSun technology over a wide range of operating temperature. The power increase ranges between 10% and 25%. Another key advantage of DualSun panels is their flexibility in orientation, making them adaptable to different types of roofs. Indeed, they have dimensions and a frame of standard PV panels, so they adapt to many installation systems for framed photovoltaic panels including most roof integration systems. This is not the case for all hybrid panels. Furthermore, they are equipped with flexible hydraulic couplings with quick couplers that allow quick and easy installation, see Errore: sorgente del riferimento non trovata and a new patented solution to enable PV/T modules to be connected quickly from the backside (FR1781619), dealing with the very small space at the backside. These hydraulic connections are widely tested in the solar thermal field. They were chosen by the DualSun engineers because their manufacturer has obtained the right to use the CSTBat Flexible brand, which attests to their good quality. This quick and easy installation is not the case for all hybrid panels. Combining high-vacuum in a flat box, TVP has introduced a radical innovation to solar thermal by maximizing performance while adhering to the construction simplicity and low cost of a conventional flat plate collector. This is achieved via the best transparent insulating material: a high-quality vacuum with internal pressure below 10-3mbar, or “high-vacuum.” High-vacuum completely suppresses convection losses within the TVP collector, strongly increasing the retention of heat in the absorber. This enhances the overall conversion efficiency of solar radiation into useful thermal energy. Planar layout maximizes collector active area and allows the heat transfer fluid to remain entirely within the TVP high-vacuum collector, further improving efficiency. TVP, with its High Vacuum Solar Thermal technology, is already addressing applications requiring operating temperatures between 100 and 180ºC via the MT-Power panel. MT-Power v4, is the only solar thermal collector in the world certified by international standard Solar KeyMark (the certificate is attached under “Optional annex 4”) to operate up to 200°C (Tm-Ta), with high solar-to-thermal efficiency (>50%), with wide installation worldwide. Based on the same high-vacuum technology (how to make, maintain and inspect high-vacuum insulation in flat envelops) and related patented IP already implemented in MT-Power, TVP is developing a new product line, LT-Power, dedicated to residential (small scale) and commercial (mid-scale) applications. The LT-Power panel and related newly engineered balance of system, currently under development, targets mid-scale heating deployments between 75 to 90°C, mainly for countries with low irradiance. It features a novel heat absorber with stagnation limited at 230°C, while maintaining industry-best performance below 100°C; its output is compliant with both households and district network piping. 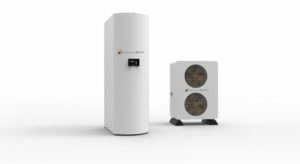 The LT-Power uniquely provides thermal energy production up to 90°C even in winter periods and cold climates and can also serve to heat in winter and cooling in summer driving absorption or adsorption chillers or thermally driven heat pumps. The new LT-Power panel aims to be able to work with > 64% peak power efficiency up 90°C. The uniqueness in the performance of this new panel relies on the ability to provide at least 75°C in winter time, even with limited irradiance and a cold climate (near 0°C), which is the minimum required temperature for traditional household heating radiators. When taking into consideration the efficiency of sensible thermal storage, there exist strong issues which condition the performances of the thermal storage and which consists of the safeguarding of the smallest thermal stratification zone within the tank. Indeed, to obtain thermal storage of quality, it is necessary to obtain a strong variation in temperature between the two ends of storage, in particular between the top and the bottom of the thermal device of storage considered in driving position. In order to preserve the quality of storage and thus this heat gradient, it is necessary to be able to distribute, namely to inject and/or tap, coolant without introducing convective movements responsible then for the thermal de-stratification. When the temperatures of injection are not constant, it is also necessary to be able to inject the fluid at a temperature given within a layer of adequate temperature to avoid a mixture of the fluid stored in the tank of the device of storage. Simple methods, like the fixed injection one, proved to be interesting when the inlet temperatures are constant and that the flow is low. However, it generates a stratification of poor quality. There exists also the principle of injection known as of the “cane of stratification” which allows energy distribution by natural convection. More precisely, the fluid goes up inside a tube thermo-syphon (stratification canes) with bored holes for the injection of fluid in the tank. By the difference in density, the fluid circulates in the cane of stratification until reaching the height of the of the same layer temperature. 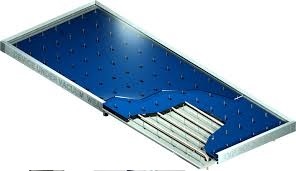 The Ratiotherm company, in particular under the reference Oskar (®) proposes such stratification systems. Thus, various drains come to be grafted with the cane of stratification in the form of spiral and openings. 1 S. Vasta, V. Palomba, D. La Rosa, W. Mittelbach. Adsorption-compression cascade cycles: an experimental study. Energy Conversion and Management, 156, 365-375, 2018.